Who is he? What is this place? Why am I here? Find out more about Plok, his world, the cast of characters, and the comic strip itself. The Pickford Bros are constantly being bombarded with fan-mail requests to bring back Plok - to develop sequel or to re-release the SNES game on Wii Virtual Console, 3DS, iOS, etc. After being out of action for 20 years John and Ste felt that a regular comic strip would be a great way to re-introduce Plok to the world. Will Plok return in his own game? Anything is possible, but for now he's got a lot to catch up on, and the brothers can draw new comic strips a lot faster than they can make new games! Find out more about the different Series that Plok Comic Strip epsiodes belong to, and find shortcuts to access episodes in each individual Series or Volume. 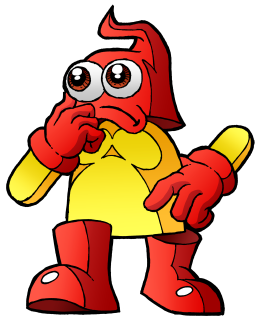 Plok's world is inhabited by a variety of characters, some who appeared in the SNES game, some who've never been seen before. The first video game released starring Plok! 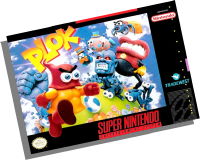 Plok was a video game released in 1993 by Tradewest (in the US), Nintendo (in Europe) and Activision (in Japan). The game was developed by Software Creations, designed and produced by The Pickford Bros, programmed by John Buckly, with graphics by Lyndon Brooke and music by Tim and Geoff Follin. » View the Softography entry for Plok! Plok started life as the lead character in an unreleased coin-op game called Fleapit. This was developed in the late 1980s by The Pickford Bros at their studio Zippo games for Rare's custom coin-op hardware.